Solomon, aka CL Solomon, is a handsome 7-year-old brindle male, born July 28, 2000. His sire is Oswald Cobblepot and his dam is Red Capsule. 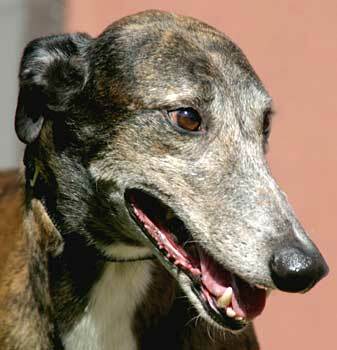 Solomon's racing career spans 134 races, starting November 20, 2002, at Gulf Greyhound Park in La Marque, TX, and ended February 2, 2005, at Corpus Christi. Since that time, Solomon was the personal pet of a kennel owner at Valley Race Park who passed away suddenly in December 2006. 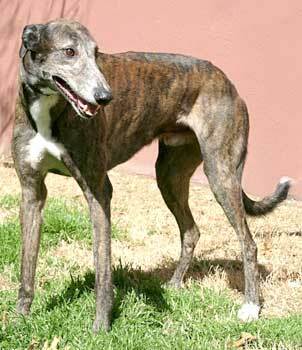 Solomon, along with Fly, Tucker, and Sue Bee, was flown from VRP to Addison Airport by GALT volunteers and adopters Jane and Michael Scott on February 26, 2007. After evaluation by Dr. Jeff Ellis of VCA Preston Park Animal Hospital, it was determined that Solomon had two tick-borne diseases, Ehrlichia and Babesia. He has been successfully treated for both and will need to be periodically monitored for the rest of his life. It is not known at this time if Solomon is small animal or cat tolerant.